Les Schwab offers a large range of tires for your 2014 Cadillac CTS 2.0L Turbo Standard. Just enter some more info to pull up the best All-Season, Winter, Traction, Performance and All-Terrain tires for your vehicle. At Les Schwab, every purchase of car, SUV, or light truck tires comes with a tire warranty plus free services that give more for your money. 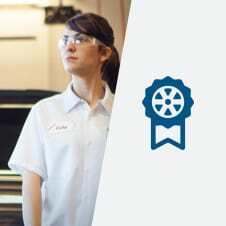 Our warranty, among the industry’s best, is good at any of our 480+ Les Schwab stores. It’s easy to stand by our workmanship when we have hard-working employees who love doing what they do.